Join us on May 9 and learn from Alana Levine, the current chair person for the Arizona Recycling Coalition (AzRC). 1312 N Scottsdale Rd, Scottsdale, AZ 85257. 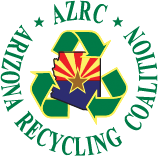 AzRC is a membership-based, non-profit organization dedicated to promoting waste reuse, reduction and recycling throughout Arizona and our southwestern region. An overview of international economic policy that is impacting the industry. How AzRC advances the mission of promoting waste reuse, reduction and recycling throughout Arizona and lessons learned that may help any green business advance their mission. How AzRC helps educate the public, and supports building a market for recycling services and recycled products. Insights on alliance building and competitors working together to grow the industry. AzRC and Alana are at the forefront of promoting Arizona's circular economy where we keep resources in use for as long as possible, extract the maximum value from them whilst in use, then recover and regenerate products and materials at the end of each service life.